The First Amendment to the United States Constitution provides that "Congress shall make no law respecting an establishment of religion, or prohibiting the free exercise thereof ..." and Article VI specifies that "no religious Test shall ever be required as a Qualification to any Office or public Trust under the United States." The modern concept of a wholly secular government is sometimes credited to the writings of English philosopher John Locke, but the phrase "separation of church and state" in this context is generally traced to a January 1, 1802 letter by Thomas Jefferson, addressed to the Danbury Baptist Association in Connecticut, and published in a Massachusetts newspaper. Echoing the language of the founder of the first Baptist church in America, Roger Williams—who had written in 1644 of "[A] hedge or wall of separation between the garden of the church and the wilderness of the world"—Jefferson wrote, "I contemplate with sovereign reverence that act of the whole American people which declared that their legislature should 'make no law respecting an establishment of religion, or prohibiting the free exercise thereof,' thus building a wall of separation between Church & State." Many early immigrant groups traveled to America to worship freely, particularly after the English Civil War and religious conflict in France and Germany. They included nonconformists like the Puritans, as well as Catholics. Despite a common background, the groups' views on religious toleration were mixed. While some such as Roger Williams of Rhode Island and William Penn of Pennsylvania ensured the protection of religious minorities within their colonies, others like the Plymouth Colony and Massachusetts Bay Colony had established churches. The Dutch colony of New Netherland established the Dutch Reformed Church and outlawed all other worship, though enforcement was sparse. Religious conformity was desired partly for financial reasons: the established Church was responsible for poverty relief, putting dissenting churches at a significant disadvantage. The colony of Plymouth was founded by Pilgrims, English Dissenters or Separatists, Calvinists. The colonies of Massachusetts Bay, New Haven, and New Hampshire were founded by Puritan, Calvinist, Protestants. The colonies of Church of England. When New France was transferred to Great Britain in 1763, the Catholic Church remained under toleration, but Huguenots were allowed entrance where they had formerly been banned from settlement by Parisian authorities. The Colony of Maryland was founded by a charter granted in 1632 to George Calvert, secretary of state to Charles I, and his son Cecil, both recent converts to Catholicism. Under their leadership many English Catholic gentry families settled in Maryland. However, the colonial government was officially neutral in religious affairs, granting toleration to all Christian groups and enjoining them to avoid actions which antagonized the others. On several occasions low-church dissenters led insurrections which temporarily overthrew the Calvert rule. In 1689, when William and Mary came to the English throne, they acceded to demands to revoke the original royal charter. In 1701 the Church of England was proclaimed, and in the course of the eighteenth century Maryland Catholics were first barred from public office, then disenfranchised, although not all of the laws passed against them (notably laws restricting property rights and imposing penalties for sending children to be educated in foreign Catholic institutions) were enforced, and some Catholics even continued to hold public office. Spanish Florida was ceded to Great Britain in 1763, the British divided Florida into two colonies. Both East and West Florida continued a policy of toleration for the Catholic Residents. The Colony of Rhode Island and Providence Plantations, founded by religious dissenters forced to flee the Massachusetts Bay colony, is widely regarded as the first polity to grant religious freedom to all its citizens. ^Note 5: The North Carolina Constitution of 1776 disestablished the Anglican church, but until 1835 the NC Constitution allowed only Protestants to hold public office. From 1835-1876 it allowed only Christians (including Catholics) to hold public office. Article VI, Section 8 of the current NC Constitution forbids only atheists from holding public office. Such clauses were held by the United States Supreme Court to be unenforceable in the 1961 case of Torcaso v. Watkins, when the court ruled unanimously that such clauses constituted a religious test incompatible with First and Fourteenth Amendment protections. "Allowing rights and immunities of citizenship. It is now no more that toleration is spoken of, as if it were by the indulgence of one class of people, that another enjoyed the exercise of their inherent natural rights. For happily the Government of the United States, which gives to bigotry no sanction, to persecution no assistance requires only that they who live under its protection should demean themselves as good citizens, in giving it on all occasions their effectual support." There were also opponents to the support of any established church even at the state level. In 1773, Isaac Backus, a prominent Baptist minister in New England, wrote against a state sanctioned religion, saying: "Now who can hear Christ declare, that his kingdom is, not of this world, and yet believe that this blending of church and state together can be pleasing to him?" He also observed that when "church and state are separate, the effects are happy, and they do not at all interfere with each other: but where they have been confounded together, no tongue nor pen can fully describe the mischiefs that have ensued." Thomas Jefferson's influential Virginia Statute for Religious Freedom was enacted in 1786, five years before the Bill of Rights. Jefferson's letter entered American jurisprudence in the 1878 Mormon polygamy case Reynolds v. U.S., in which the court cited Jefferson and Madison, seeking a legal definition for the word religion. Writing for the majority, Justice Stephen Johnson Field cited Jefferson's Letter to the Danbury Baptists to state that "Congress was deprived of all legislative power over mere opinion, but was left free to reach actions which were in violation of social duties or subversive of good order." Considering this, the court ruled that outlawing polygamy was constitutional. The Duke of York had required that every community in his new lands of New York and New Jersey support some church, but this was more often Dutch Reformed, Quaker or Presbyterian, than Anglican. Some chose to support more than one church. He also ordained that the tax-payers were free, having paid his local tax, to choose their own church. The terms for the surrender of New Amsterdam had provided that the Dutch would have liberty of conscience, and the Duke, as an openly divine-right Catholic, was no friend of Anglicanism. The first Anglican minister in New Jersey arrived in 1698, though Anglicanism was more popular in New York. The first amendment to the US Constitution states "Congress shall make no law respecting an establishment of religion, or prohibiting the free exercise thereof" The two parts, known as the "establishment clause" and the "free exercise clause" respectively, form the textual basis for the Supreme Court's interpretations of the "separation of church and state" doctrine. Three central concepts were derived from the 1st Amendment which became America's doctrine for church-state separation: no coercion in religious matters, no expectation to support a religion against one's will, and religious liberty encompasses all religions. In sum, citizens are free to embrace or reject a faith, any support for religion - financial or physical - must be voluntary, and all religions are equal in the eyes of the law with no special preference or favoritism. "The American separation of church and state rests upon respect for the church; the [European anticlerical] separation, on indifference and hatred of the church, and of religion itself…. The constitution did not create a nation, nor its religion and institutions. It found them already existing, and was framed for the purpose of protecting them under a republican form of government, in a rule of the people, by the people, and for the people." An August 15, 1789 entry in Madison's papers indicates he intended for the establishment clause to prevent the government imposition of religious beliefs on individuals. The entry says: "Mr. Madison said he apprehended the meaning of the words to be, that Congress should not establish a religion, and enforce the legal observation of it by law, nor compel men to worship God in any manner contrary to their conscience. ..."
Some legal scholars, such as John Baker of LSU, theorize that Madison's initial proposed language—that Congress should make no law regarding the establishment of a "national religion"—was rejected by the House, in favor of the more general "religion" in an effort to appease the Anti-Federalists. To both the Anti-Federalists and the Federalists, the very word "national" was a cause for alarm because of the experience under the British crown. During the debate over the establishment clause, Rep. Elbridge Gerry of Massachusetts took issue with Madison's language regarding whether the government was a national or federal government (in which the states retained their individual sovereignty), which Baker suggests compelled Madison to withdraw his language from the debate. The incorporation of the First Amendment establishment clause in the landmark case of Everson v. Board of Education has impacted the subsequent interpretation of the separation of church and state in regard to the state governments. Although upholding the state law in that case, which provided for public busing to private religious schools, the Supreme Court held that the First Amendment establishment clause was fully applicable to the state governments. A more recent case involving the application of this principle against the states was Board of Education of Kiryas Joel Village School District v. Grumet (1994). Justice Sandra Day O'Connor in her opinion on the 2005 Ten Commandments ruling. These critics of the modern separation of church and state also note the official establishment of religion in several of the states at the time of ratification, to suggest that the modern incorporation of the Establishment Clause as to state governments goes against the original constitutional intent. The issue is complex, however, as the incorporation ultimately bases on the passage of the 14th Amendment in 1868, at which point the first amendment's application to the state government was recognized. Many of these constitutional debates relate to the competing interpretive theories of originalism versus modern, progressivist theories such as the doctrine of the Living Constitution. Other debates center on the principle of the law of the land in America being defined not just by the Constitution's Supremacy Clause, but also by legal precedence, making an accurate reading of the Constitution subject to the mores and values of a given era, and rendering the concept of historical revisionism irrelevant when discussing the Constitution. The "religious test" clause has been interpreted to cover both elected officials and appointed ones, career civil servants as well as political appointees. Religious beliefs or the lack of them have therefore not been permissible tests or qualifications with regard to federal employees since the ratification of the Constitution. Seven states, however, have language included in their Bill of Rights, Declaration of Rights, or in the body of their constitutions that require state office-holders to have particular religious beliefs, though some of these have been successfully challenged in court. These states are Texas, Massachusetts, Maryland, North Carolina, Pennsylvania, South Carolina, and Tennessee. While sometimes questioned as possible violations of separation, the appointment of official chaplains for government functions, voluntary prayer meetings at the Department of Justice outside of duty hours, voluntary prayer at meals in U.S. armed forces, inclusion of the (optional) phrase "so help me God" in the oaths for many elected offices, FBI agents, etc., have been held not to violate the First Amendment, since they fall within the realm of free exercise of religion. Relaxed zoning rules and special parking privileges for churches, the tax-free status of church property, the fact that Christmas is a federal holiday, etc., have also been questioned, but have been considered examples of the governmental prerogative in deciding practical and beneficial arrangements for the society. The national motto "In God We Trust" has been challenged as a violation, but the Supreme Court has ruled that ceremonial deism is not religious in nature. Steven Waldman notes that; "The evangelicals provided the political muscle for the efforts of Madison and Jefferson, not merely because they wanted to block official churches but because they wanted to keep the spiritual and secular worlds apart." "Religious freedom resulted from an alliance of unlikely partners," writes the historian Frank Lambert in his book The Founding Fathers and the Place of Religion in America. "New Light evangelicals such as Isaac Bachus and John Leland joined forces with Deists and skeptics such as James Madison and Thomas Jefferson to fight for a complete separation of church and state." Robert N. Bellah has argued in his writings that although the separation of church and state is grounded firmly in the constitution of the United States, this does not mean that there is no religious dimension in the political society of the United States. He used the term "Civil Religion" to describe the specific relation between politics and religion in the United States. His 1967 article analyzes the inaugural speech of John F. Kennedy: "Considering the separation of church and state, how is a president justified in using the word 'God' at all? The answer is that the separation of church and state has not denied the political realm a religious dimension." Robert S. Wood has argued that the United States is a model for the world in terms of how a separation of church and state—no state-run or state-established church—is good for both the church and the state, allowing a variety of religions to flourish. Speaking at the Toronto-based Center for New Religions, Wood said that the freedom of conscience and assembly allowed under such a system has led to a "remarkable religiosity" in the United States that isn't present in other industrialized nations. Wood believes that the U.S. operates on "a sort of civic religion," which includes a generally-shared belief in a creator who "expects better of us." Beyond that, individuals are free to decide how they want to believe and fill in their own creeds and express their conscience. He calls this approach the "genius of religious sentiment in the United States." ^ Jefferson's Danbury letter has been cited favorably by the Supreme Court several times, notwithstanding that the Court has also criticized it. In its 1879 Reynolds v. United States decision the high court said Jefferson's observations 'may be accepted almost as an authoritative declaration of the scope and effect of the [First] Amendment.' In the court's 1947 Everson v. Board of Education decision, Justice Hugo Black wrote, 'In the words of Thomas Jefferson, the clause against establishment of religion by law was intended to erect a wall of separation between church and state.' It is only in recent times that separation has come under attack by judges in the federal court system who oppose separation of church and state (Why The Religious Right is Wrong About Separation of Church & State, Robert Boston, Prometheus, Buffalo, New York, 1993, p. 221). ^ "Rights of the People: Individual freedom and the Bill of Rights". US State Department. December 2003. Retrieved 2007-04-06. ^ Library of Congress. "To Bigotry No Sanction". American Treasures of the Library of Congress. Retrieved 2007-02-07. ^ James Madison. "Monopolies Perpetuities Corporations—Ecclesiastical Endowments". constitution.org. Retrieved 2008-06-16. ^ Paschal, George (2007-03-23). The Constitution of the United States Defined and Carefully Annotated. W.H.& O.H. Morrison Law Booksellers. p. 254. ^ Boston, Rob (2012). [ "A Delicate Balance"]. Conscience 33 (2): 12–16. Retrieved 2014-11-19. ^ Forgotten Purposes of the First Amendment Religion Clauses Gary D. Glenn. The Review of Politics, Vol. 49, No. 3 (Summer, 1987), pp. 340–367. 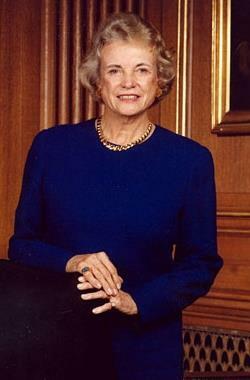 ^ Sandra Day O'Connor (June 27, 2005). "McCreary County vs. American Civil Liberties Union of Kentucky". Legal Information Institute, Cornell university Law Department. Retrieved 2012-09-13. ^ "US federal court rejects separation of church and state". Catholic World News. 2005-12-22. Retrieved 2007-02-07. ^ Thomas White (2007). First Freedom: The Baptist Perspective on Religious Liberty. B&H Publishing Group. p. 107. ^ "Religious discrimination in state constitutions". ReligiousTolerance.org. Retrieved 2007-02-07. ^ Bellah, Robert Neelly (Winter 1967). "Civil Religion in America". Journal of the American Academy of Arts and Sciences 96 (1): 1–21. Archived from the original on 2005-03-06. From the issue entitled Religion in America. "Rights of the People - The Roots of Religious Liberty". U.S. Department of State, International Information Programs. Retrieved 2007-04-07. "Rights of the People - Religious liberty in the Modern era". U.S. Department of State, International Information Programs. Retrieved 2007-04-07. Robert Struble, Jr., Treatise on Twelve Lights: To Restore America the Beautiful under God and the Written Constitution, 2007–08 edition.